Hi, I had the chance to see the first episode of 'Breakthrough with Tony Robbins'. Touching as always when it comes to Tony, and this time he solves the relationship problems of a couple in the extreme situation where the groom becoming paralysed on his wedding day. Tony Robbins works a lot here on the relationship and some things can be recognized from the extraordinary "Ultimate Relationship" dvd series (see clips in older posts). all executed in a brilliant fashion by Tony. More on the news of another UPW with Anthony Robbins. There were just brilliant transformational energies as usual at the latest UPW in Rome last month. For you who missed there is a new chance next year. This time in September 23rd-26th in Rimini, Italy. For location and travel check out this post. As usual it's a four days event of Tony Robbins' energy and inspiration. Tickets are just confirmed and we are proud to again be able to offer what we think is the best section to a fair price. Premium section row 6-15 in the center of the stage and row 1-15 on the sides. All brilliant for the best Tony Robbins experience. Launch price in July Euro 1295. Regular price from other distributors 1900 Euro. Take the chance to make this the perfect deal and book hotel and flight already now. another Unleash the Power Within is now scheduled. 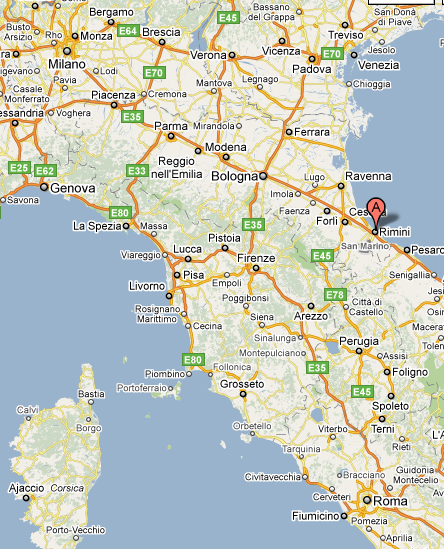 Again Italy but this time Rimini on the east coast. So were is that exactly? Check out this map. Rimini is at the 'A'. Rimini has an airport, you can also go from Venize/Venedig were trains are just 3 hours to Rimini. For budget airlines Pisa (Ryanair to/from Sweden) is about 4 hours by train away. Rome and Milano has also great train connection to Rimini.